i'm looking for a steady supply of high QL olive oil, several KGs per month, but it needs to be high QL (80+, 90+ is preferred). i believe that when shipping oil you pay once for the container, and once for the shipping of every 1kg of oil, so would prefer xanadu shipping fees. Let me know either in-game, reply to this thread or PM me please. Grand opening of Smokes massage parlor? EDIT: And now it is. still looking! any bartenders out there?? I share your pain, been a secondary goal of mine for some time to be able to consistently make nice olive oil. Did a test today and at 57 forestry and 84ql sickle, 8% of the olives could be pressed to meet your requirements. And out of that, I'd probably only get 10% or less olive oil at 80+ql, despite the fact I got a 90ql supreme fruit press. I'll offer 80+ql olive oil at 2s per kg, but no guarantee that I'll actually even get any. 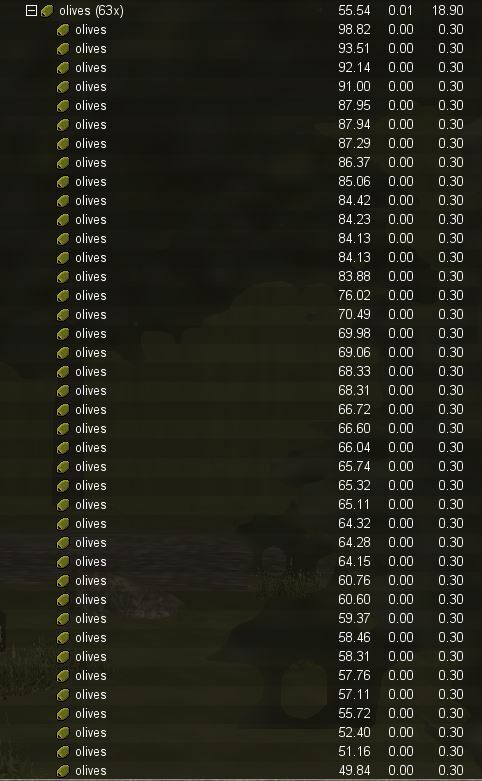 With 48 forestry and 44 beverages, I can harvest around 10% of olives at 70+ql and around 5% pressed to olive oil at 70+ql (if that). There is no consistency in it at these skill levels. I might try later i have 70 forestry with supreme sickle and fruit press my beverage skill is super low though. Wont risk making into olive oil, but if you want to buy these let me know. although i have poor beverage skill, i wouldn't risk it either.